Can you write some articles about football analysis? It doesn’t matter which league you want to write. If your answer is “yes”, you are the person we are looking for. footballperformanceanalysis.com is looking for football analysis writer for the season 2017-18. We can provide a platform to develop your personal brand. Our website got nearly 60,000 views in 2016. When we post your article, the article is still under your name, not my name. We just provide a platform for everyone who is interested in football analysis to share ideas. If you are interested in this opportunity, please drop me an email (ctcleo@gmail.com). It appears that it’s time to start paying attention to Chelsea again in the Premier League. This time last season, as everyone remembers, the Blues were in the midst of a baffling and unexpected slide that saw them dip down toward the relegation zone by the midpoint of the campaign. José Mourinho was sacked, and while Chelsea righted the ship somewhat down the stretch, they were much too far out of contention to be relevant. The only question that remained was whether it would be a one-year aberration or a sign of trouble to come at Stamford Bridge. We surely don’t have a definitive answer just yet but all early indications point to Chelsea being back on track. After three weeks of match play, the Blues are second in the league tables with nine points on a perfect 3-0-0 record and a plus-five goal differential. Only Manchester City has been more impressive from a numbers standpoint, with identical points and record but a plus-six differential. It’s still very early but only one other club (Manchester United) has won its opening three matches. As a result, Chelsea is already being viewed as an EPL title challenger once more. The football betting odds at Betfair currently have the Blues at 5.5 to win the league, behind the two clubs from Manchester but ahead of everyone else. And those odds are only going to improve if they keep up their level of play against a tricky field of competitors throughout September. But it’s how Chelsea has turned things around that’s most interesting. And really, there’s no other way to put it than that Antonio Conte already seems to deserve a tremendous amount of credit. The former Juventus player and manager, who’s also coached the Italian national team of late, signed on to man the resurgence at Stamford Bridge this past summer, and looks to be well suited indeed to Premier League play. From a philosophical standpoint, Conte is known as a manager who’s not afraid to share his opinions with players or upper management, and who puts a great deal of stock in preparation. The best way to describe him, as was done in Telegraph’s handy write-up of everything you need to know about Conte, is that he takes a no-nonsense approach. He’s known for having fallen out with Juventus ownership even after helping the team to return to glory following match fixing scandals, and he apparently doesn’t hesitate to berate even star players when he deems it necessary. Andrea Pirlo is quoted in the Telegraph piece essentially giving credit to Conte for knowing when to push his buttons with a hard-hitting but accurate critique. In terms of his outlook on match preparation, Conte is recognised as something of a workaholic, for lack of a better term. Part of the “no nonsense” approach mentioned previously is that he plans in detail for each game, as opposed to relying purely on his own tactics or development to lead to success. Those tactics, however, are generally known to favour a 3-5-2 formation, which would be a little bit unusual in the Premier League. A thorough article questioning whether 3-5-2 could work for Chelsea described Conte’s Juventus teams in simple but apt terms: it was a cerebral team backed by power, pace, and skill. More specifically it was a squad backed by exceptional talent on the defensive end that could afford to keep just three players back, relying on Pirlo’s distribution and some creative and talented attackers to generate quick offensive pushes. Many among the Chelsea faithful doubted whether a similar approach would work at Stamford Bridge – particularly after watching Louis van Gaal try and fail to implement something similar with Man Utd. in recent seasons. Perhaps, then, it shouldn’t be surprising that Conte has come out with something markedly different in the early going. The Blues appear to have favoured a 4-2-4 formation for the most part, and clearly it’s gone well. A 4-2-4 asks a lot of the wingers, but as this is undeniably a position of strength for Chelsea, it appears that Conte has simply adjusted his tactics to take advantage of what he’s got. The formation showed itself off in a recent 3-0 win over Burnley in which Eden Hazard and Willian each scored while doing outstanding work out wide. Running a 4-2-4, the Blues are stable at the back while still being able to spread out opposing defenses, ultimately still using some of their top talents out wide to penetrate and attack the box. Again, it’s asking a lot of the wing players, but thus far they’ve been up to the task. Time will tell how Conte settles in as manager at Stamford Bridge, given that we’re only in the beginning of September. But at this early stage his hard-nosed approach appears to have struck a cord with a team that’s visibly playing harder than a season ago, and the on-field strategy has been effective. Performance analysis is not just about analysing matches and games. It is essential in the training programme to help coaches improve players’ performance. The following figure shows the coaching cycle. Performance analysis plays a key role in this cycle. Starting from the top, “Performance” means the performance in the game or training. “Observation” can be from the coach or video camera. Since research indicates that coaches are able to recall fewer than half of the key incidents that arise during the game, video camera is a better way which can record all the key events (actions and movements) for further analysis. In “Analysis”, it means analysis of data which include data management. For example, using performance analysis software to code the game, editing footages from the camera, extraction of data from data provider, etc. These are the areas in which the performance analyst spent most of the time. The product of this “analysis” stage can be statistical analysis and video recordings. In “Interpretation”, it can be put in two ways according to my experience. It could be done by coach or performance analyst. Some analysts have the authorisation from coach to interpret the data and then write a report or make a presentation to the coach or team. Some coaches just want the data from performance analysts and the coaches will interpret the data by themselves. It really depends on the coaches’ preference and the partnership between the analyst and the coach. After that, “planning” means the coach plan what to do after knowing what went wrong or which part the team did well. The coaches have to evaluate the performance prior to this planning stage. Otherwise, he doesn’t know how to improve the team’s performance in the next match. In most of the cases, it means the planning of the coaching session using the result of the performance analysis. “Preparation” means the execution of those coaching session in the training so prepare the team for the coming game. It will go back to the “Performance” stage and the whole cycle keep going. 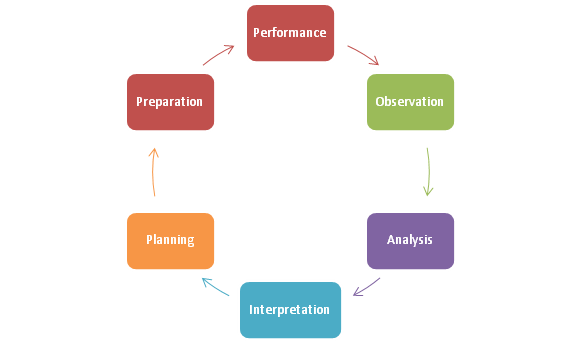 In my opinion, performance analysis plays a key role in three stages in this cycle: “observation”, “analysis” and “interpretation”. Space has two different meanings in this factor. Firstly, it means the space in the prime target area. As I mentioned last week, the crosses hitting to the back of the defence is the best option because it is difficult for the defenders to clear. 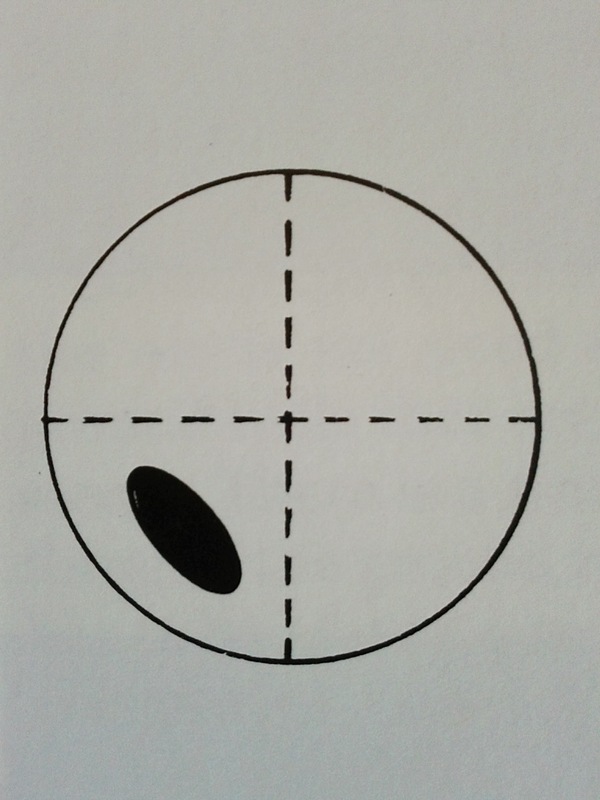 Therefore, if there is space in the prime target area, the ball should be crossed into that space as soon as possible. 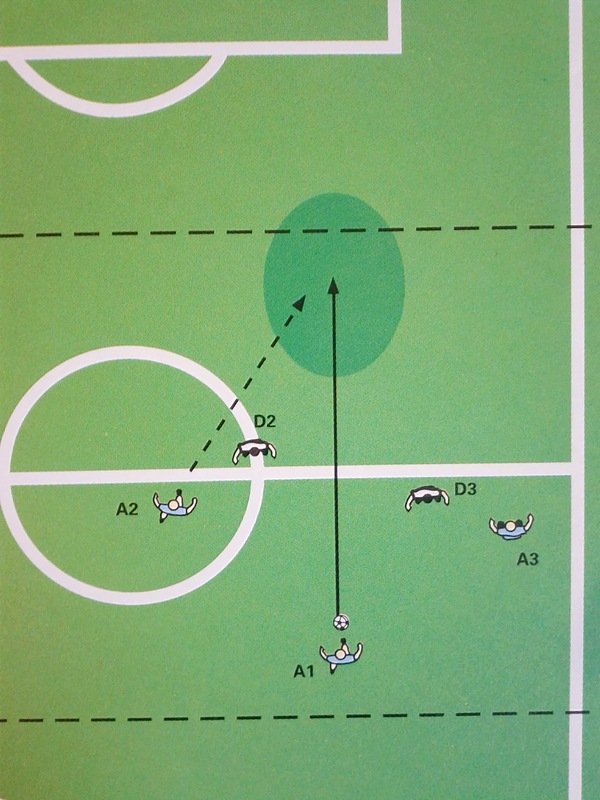 Secondly, the second meaning is about the space available on the flank for the winger to make a cross. 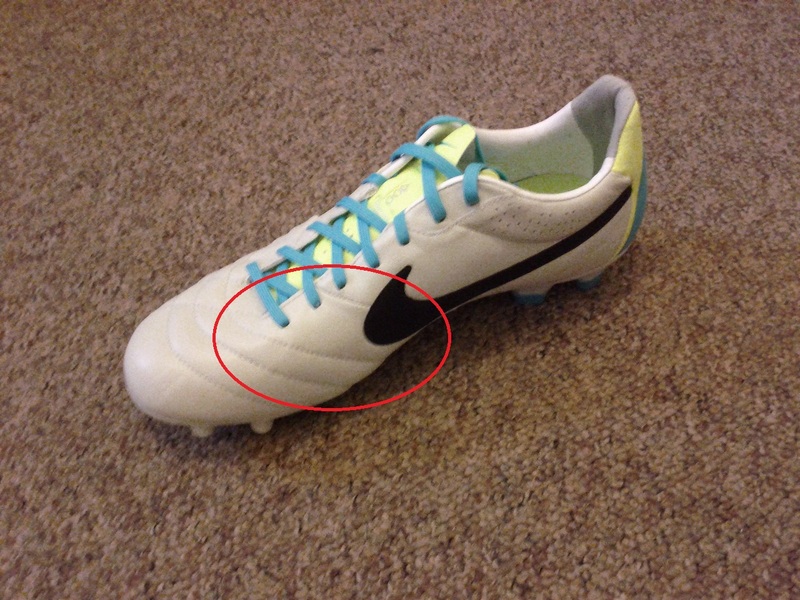 In other words, it is hard for the winger to cross the ball if he is tightly marked and he has no space at all. Goalkeeper: it will affect the placement of the delivery of the ball. 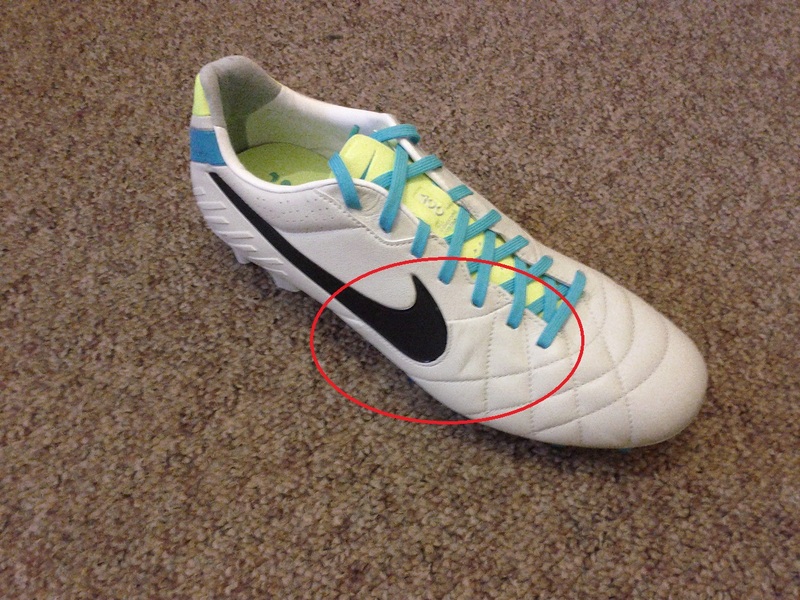 Firstly, the position of the ball affects the position of goalkeeper. 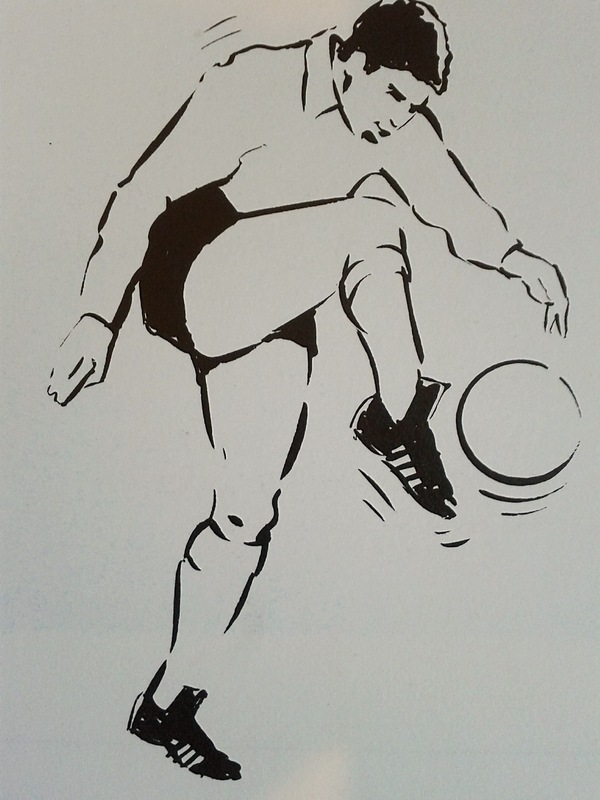 The nearer the ball is to the Goalkeeper; the more likely it is that the goalkeeper will be in the front half of his goal. 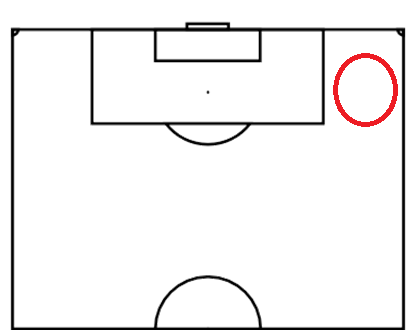 In the above figure, the ball is in the wide area (red) so the goalkeeper (blue) stands near to the near post. 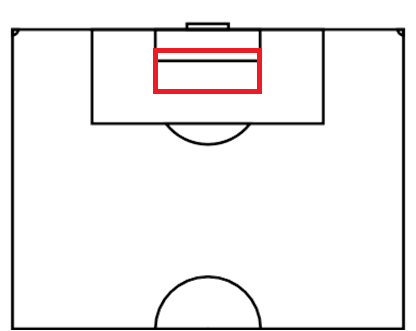 In the above figure, the ball (red) is in a deeper area so the goalkeeper stands further from the near post and goal line. No doubt, if the goalkeeper is covering the near post, it would be better to cross the ball into the far post of the prime target area because the goalkeeper can’t see the players in the far post, vice versa. Angle: it should be at least 90 degrees to end up with a good shot. 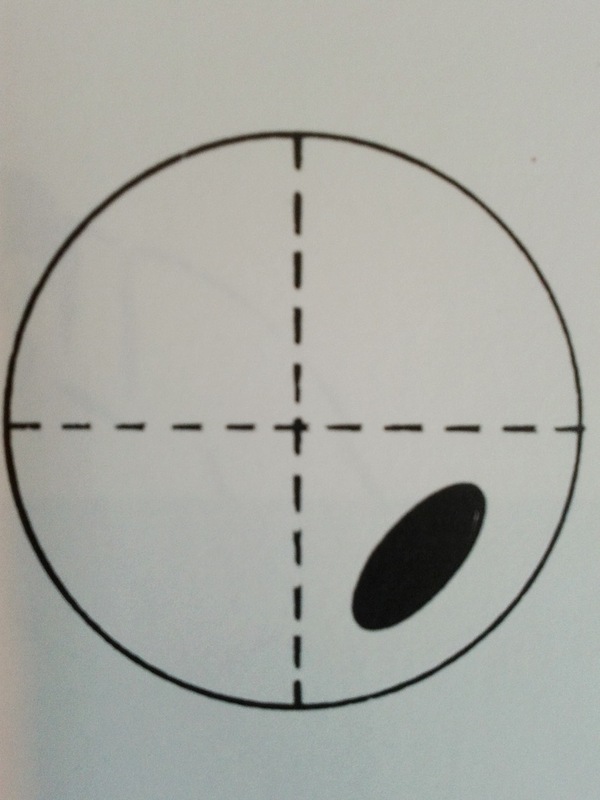 In 90 degree, the player comes across the line of flight. 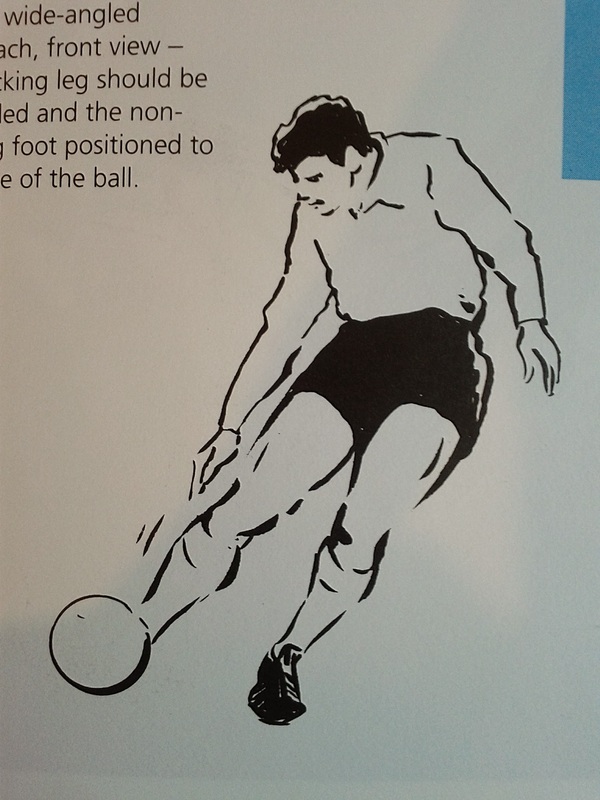 With even greater angle, the player has a better angle to see the ball which makes him a better chance of making a good contact with the ball. Timing: the attacking players should come late but at speed. 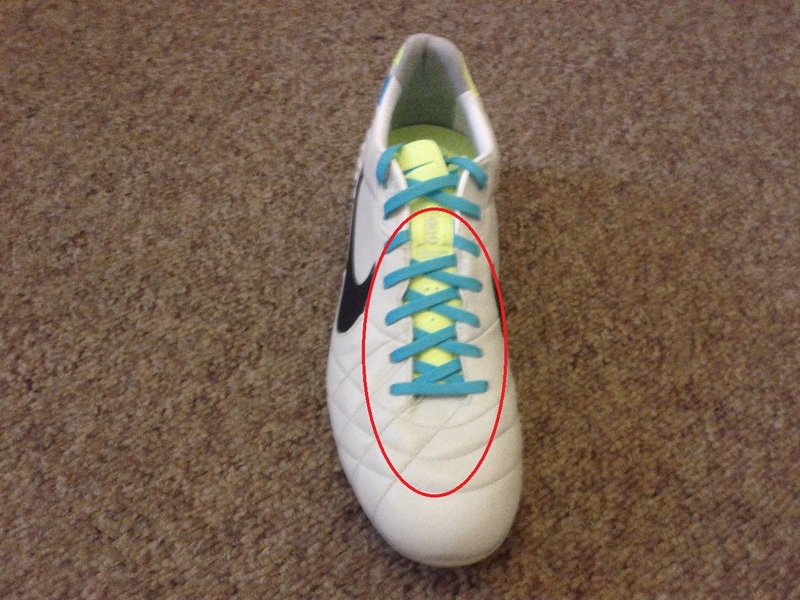 A common mistake of strikers is that they go into the target area too early. It gives time for the defenders to recover their positions and deny the space available of strikers. This is a clip I find on youtube which shows a good timing of attack from Ronaldo. The cross was made by Beckham. The contact: the contact should be the top half of the ball because the aim is to drive the ball downwards to make it more difficult for the goalkeeper to save it. In terms of which part of the body should be used, I prefer using the head rather than the feet because it requires little adjustment to the running stride. When a team attacks in the attacking third, there are two ways to attack generally: central attacks and flank attacks. Due to the importance of zone 14, the majority of the defenders would concentrate on defending the central area. The defenders’ aim is to deflect attack toward the flanks which is away from the danger area (zone 14). As a result, a good attacking team should be able to attack effectively down the flanks. 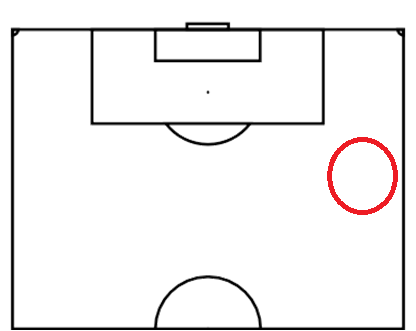 The two flanks are the areas where a team can expect to find most space in the attacking third of the field. What is the prime target area? 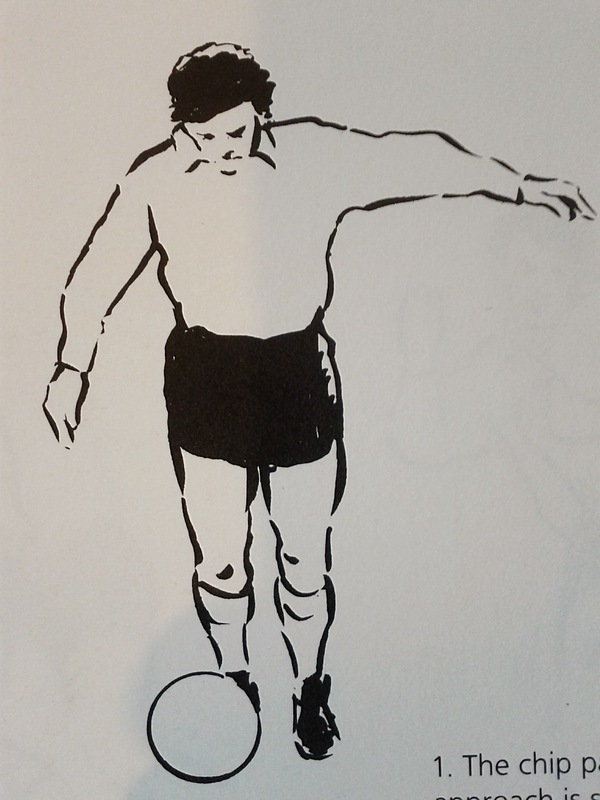 Charles Hughes suggested the concept of “prime target area” for the wingers to cross the ball. 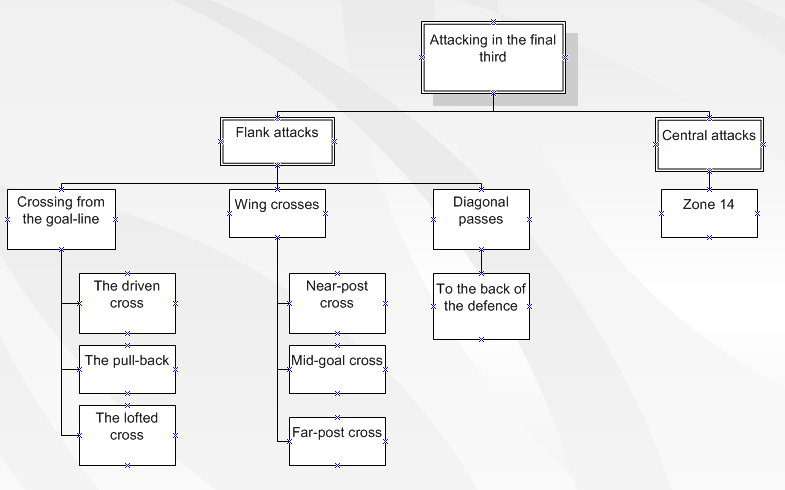 He argued the most successful type of crosses is to cross the ball to the back of the defense and into the prime target area. 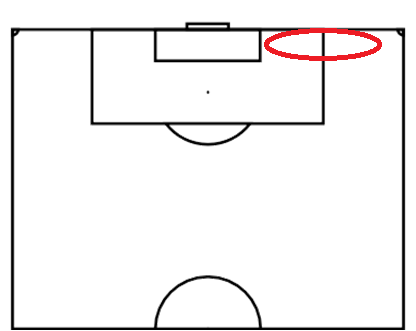 The prime target area extends out 8 yards, from 2 yards inside the 6-yard box to the penalty spot, and across 20 yards, the width of the 6-yard box. 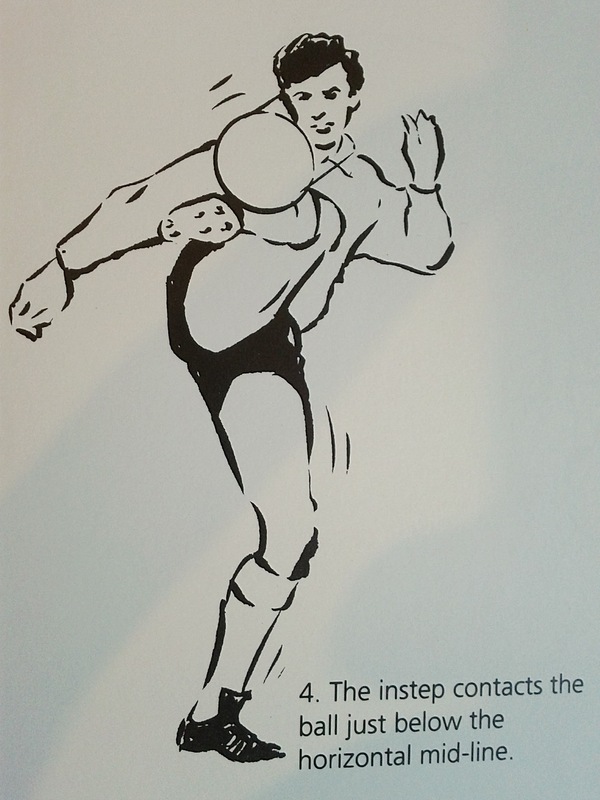 Where to release the ball? There are three different positions to release the ball in crossing: goal-line, wide area and deep area. This area is within a few yards of the touch line and next to the penalty box. Usually the winger makes cross on the run without halting his stride. This area is just inside the attacking third of the field. Therefore, it is more suitable for the full backs to cross the ball. The organisation chart in figure 1 is a guideline for the topics I am going to cover in the following few weeks. Since zone 14 was discussed before, I will focus on three types of flank attacks. The concept of passing check list was suggested by Charles Hughes in the book “The Winning Formula”. Before explaining the check list, it is worthy to understand more about his philosophy of how to play football. As a result, he made a passing check list to explain his philosophy and give a guideline to players how to play forward whenever possible. The check list is in order of priority from an attacker’s point of view. This type of pass is in the top of the priority list because it can cause the defenders more problems. 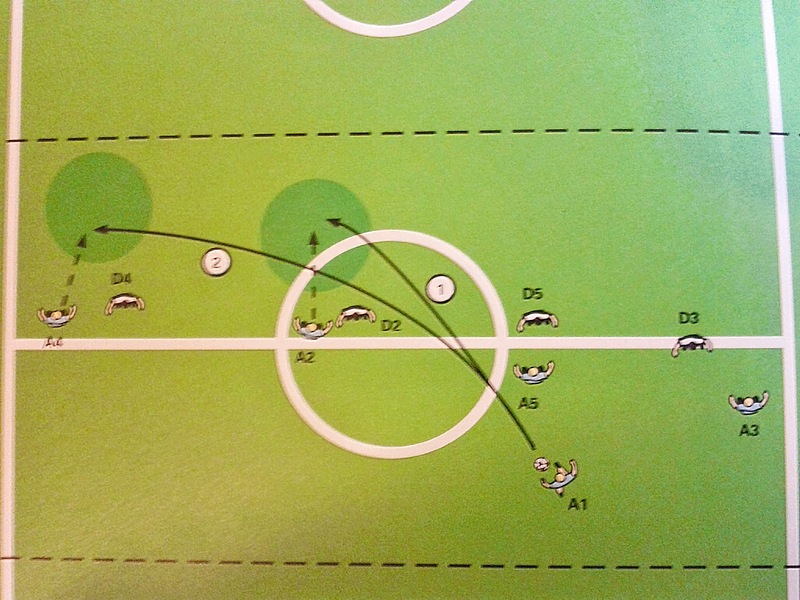 After the pass, the defenders are not facing the ball anymore, they have to turn around and run towards their goal. There are three ways to execute this type of passing. The defenders have to adjust their positions after that. If the attack is on one side and there are too many players congested in a tight area, it means there will be space on the other side. The attackers should be ready to exploit it. I agree with the theory about the passing check list but I don’t totally agree with his thoughts about direct play and possession play. I don’t think possession play is playing to avoid defeat. Instead, possession play can be used with positive attitude to penetrate the defence of opponent. Possession play can be interpreted as looking for the best chance to attack and they will attack it directly when the opportunity comes. However, some teams do pass the ball around for the sake of keeping the ball but not creating shots. It all depends on the interpretation of the team. A good example is the comparison of Barcelona and Swansea which was claimed to be British football’s Barcelona. Both teams are possession based but the key difference is the penetration in/ into the attacking third. Barcelona is using possession play to attack whenever possible but Swansea is using possession play to contain the opposition which is a defensive measure. For example, in the game v Hull City on Dec 9, 2013, Swansea had 67% of play in the middle third with only 1 shot on target in the first half (Telegraph, 2013). Another example is the stats of action zones from whoscore.com, Swansea have 25% in defending third and 26% in attacking third. On the other hand, Barcelona have 22% in defending third and 31% in attacking third. The stats illustrate the different approaches of both teams even they are both using possession play. There are many posts highlighting the problem of Swansea’s possession play football (e.g. Swansea’s set-up this season, A Breakdown Of Swansea’s Away Form In 2012/13, Possession Key To Swansea’s Relative Success, etc). In conclusion, I don’t think there is a clear line between possession play and direct play. Moreover, there is no contradiction between them. A team can be possession based and play directly to attack the space when the opportunity comes. It is still a positive attitude. On the other hand, if a team keep making long pass directly from the defending third to attacking third with no accuracy when they face pressure, I think it is a negative attitude as they fear to lose the ball in their own third so they just clear the ball (or pass with no accuracy). The passing check list is a good guideline for players no matter which style of play their team use. Although ground passes are easier for the receiver to control the ball, there are some occasions that the only way to exploit space behind opponents is to loft the ball over defenders’ head. For example, if the back four defend well like a wall in front of the goal, then the only way to attack the space behind the back four is to loft the ball into the penalty area. Moreover, a good lofted pass can attack the space quickly. A good example was Dennis Bergkamp’s goal vs. Argentina in the 1998 World Cup. The long lofted pass was made by Frank De Boer. Which basic techniques can be used? There are three basic techniques: lofted drive, volley and chip. The following organisation charts shows the details of the techniques. Because of the backspin, the ball will rise very steeply. The best footage I can think of to show the execution of the ground passes to create a goal is the second goal of Argentina vs. Serbia & Montenegro at the 2006 World Cup. Most of the passes involved were ground passes and some of the techniques they used are not covered in these 5 basic techniques (e.g. back heel pass). In the role of a football performance analyst, IT skill is one of the necessary skills in the skill set. However, it shouldn’t be over-emphasised. If what you are doing everyday is video tagging to clip and code the game footage, and then produce individual clips for individual players and coaches (e.g. putting all the shot clips together for the striker). Can you consider yourself as an analyst? Are you really analysing the game? It is a topic covered by some posts (e.g. Video Editor v Performance Analyst). My view is that a football performance analyst should do much more than that to analyse the game. For example, performance analyst should have some knowledge about data management and statistical analysis in my opinion. However, in order to analyse the game, should the analyst have some basic football knowledge also? Some posts have covered the overlapping area between the coach and the analyst (e.g. Should all coaches be analysts?). I firmly believe a football coach has a higher potential to be a better performance analyst because of the football knowledge. Therefore, I have decided to set up a new category called “Basics” in the website. “Basics” means football basics and my aim is to cover football knowledge about various techniques, principles of play and tactical knowledge, system of play (formation), etc. 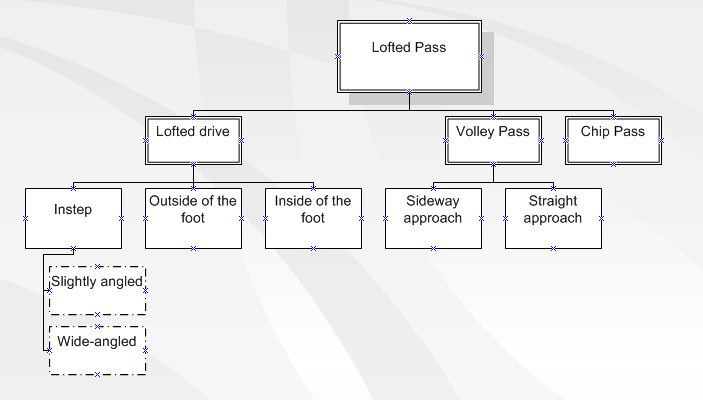 Apart from using text, I will use lots of diagrams and videos to explain the technical points in football. Why passing is so important? The first topic I choose for this new category is passing because it is very important in a football game. It is one of the two techniques used most frequently – controlling and passing the ball. When a player receives the ball, over 80% of occasions he will pass the ball to a teammate and on other occasions he will either shoot or dribble (Hughes, 1987). 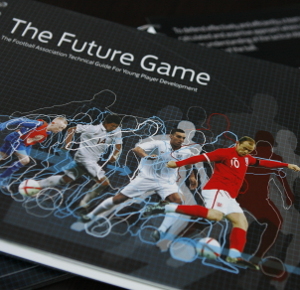 The FA emphasised the importance of passing by considering the technical demands of the game in the book “The Future Game” (FA Learning, 2010). There are different views to identify what a successful pass is. Some people said as long as a teammate has a touch of the ball then it is a successful pass (even the touch is bad and they lose possession). 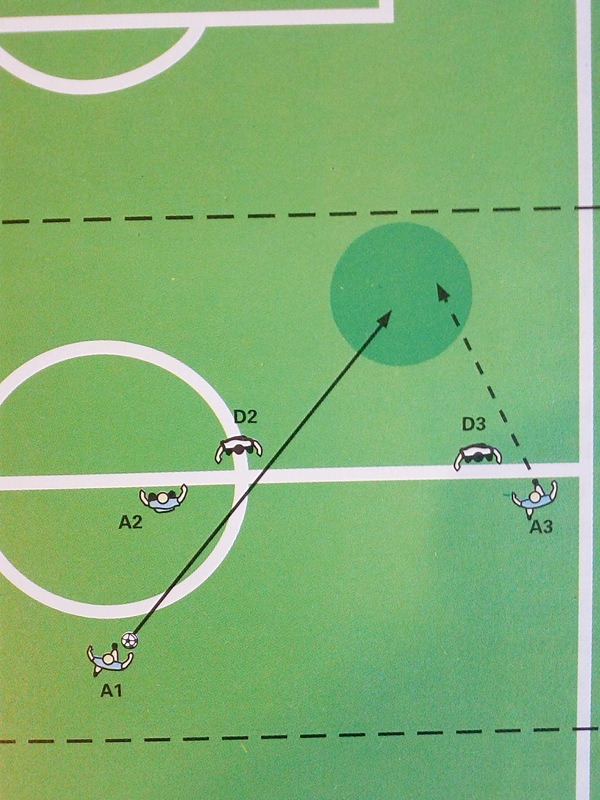 Another view suggests that the pass is successful if possession is retained (Carling et al., 2005). I prefer the latter definition. Regarding the distance of the pass, Hughes (1987) suggested that short passes are 30 yards or less and long passes are more than 30 yards. Generally, I divide passing techniques into two groups: ground pass and loft pass. There are many technical points to cover in these two passing techniques so I will leave it to next week. In conclusion, it is just a starting point of the new category. I will keep writing posts in other categories also. If you want me to talk about any particular topic, please feel free to leave the comment. 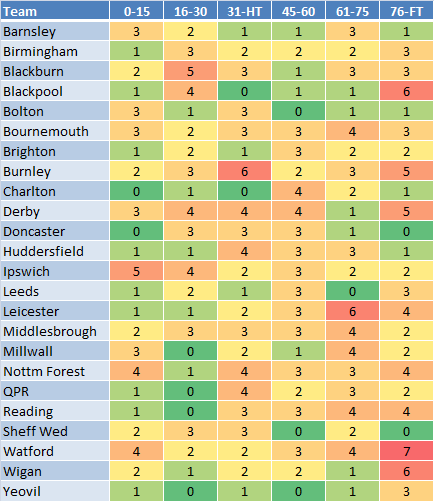 There are 337 Championship goals (updated to 17/10/2013). 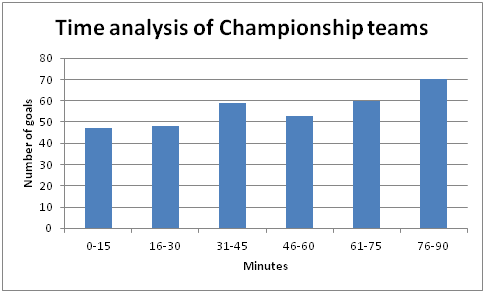 By analysing the time at which goals are scored during match play, the characteristics of the teams could be shown. The 90 minutes game was divided into six 15-min periods. The upward trend shown in the following chart fits the findings of researchers (Jinshan et al., 1993; Reilly, 1996) and the time analysis I did for League 2 last season. Moreover, it is worthy to note that more goals were scored before the end of halves. Therefore, there is a small upward trend in each half of the game. The following table shows the number of goals scored in six periods of different teams. The data were shown in a Red-Yellow-Green colour scale. That means, the higher number would be highlighted by red and the lower number would be highlighted by green for better visualisation of the data. Generally, most of the teams scored more goals in the second half which fit the general trend. However, Ipswich is an exception as they scored the most goals (5 goals) in the first 15 mins of the game. The following video shows these 5 early goals of Ipswich. Burnley is a team showing a speical characteristic that they are strong in scoring before the end of halves. They scored 6 and 5 goals before the end of first half and full time. These number are remarkably more than the number of goals they scored in other time slots. The following video shows these 11 goals Burnley scored before the end of halves. Watford scored the most goals (7 goals) in the last 15 mins of the game while Sheff Wed and Doncaster are the only teams which haven’t scored any late goal at the moment. There is an interesting fact that Doncaster haven’t scored any early goal in the first 15 mins of the game also. However, if we just count the goals scored, it is not showing the whole picture of analysis because stronger teams scored more goals. If we want to analyse more in depth, we have to convert these data into percentage. The following table shows the same set of data in percentage form. Charlton has their characteristic that they are partcularly strong when they started their second half. 50% of their goals were scored in the first 15 mins of the second half. The following videos shows these 4 early goals in the second half of the game. Blackpool, Wigan and Yeovil are the similar teams which relied heavily on the last 15 mins to score goals. These three teams had more than 40% of their goals scored in this time slot. 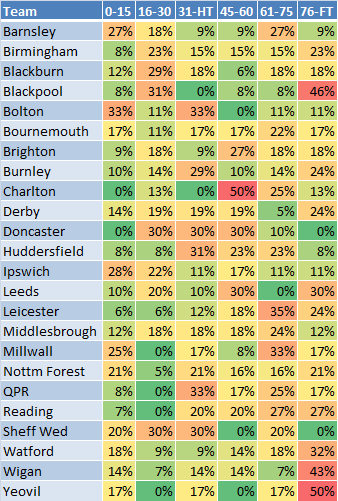 Blackpool is the only team having less than 10% of goals in 4 time slots. In other words, nearly 80% of their goals were scored in 16-30 mins and 76-full time. It could be a useful stats for the team playing against Blackpool to decide when to put more effort to defend. The following video shows the 6 goals (46%) Blackpool scored in the last 15 mins. Yeovil is another extreme example. They haven’t scored any goal in 2 time slots (16-30, 45-60) but they scored 50% of their goals in the last time slot. The team playing against them should pay extra attention to the last 15 mins of the game. The following video shows the 3 goals (50%) Yeovil scored in the last 15 mins.